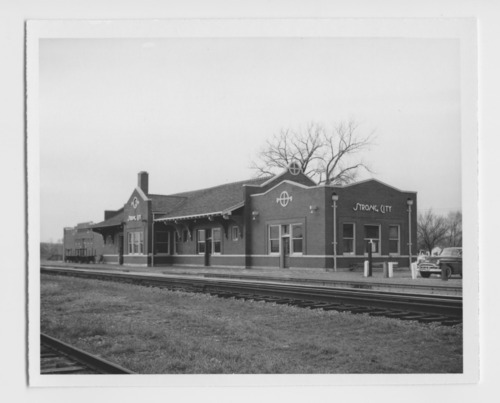 This photograph shows the Atchison, Topeka and Santa Fe Railway Company depot at mile post 131.7 in Strong City, Kansas. The one-story "county seat" style depot built in 1913, east of the original depot, features a gabled roof with a operator's bay, a waiting room and a freight room with a flat roof. The building is no longer in operation but was placed on the National Register of Historic Places.